The Georgetown Metropolitan is proud to present the first in an ongoing series of thought pieces titled “Why Not”, wherein we explore different ideas for our neighborhood that are not typically discussed. The first installment relates to the street names. As described ad naseum last week, most of the streets in Georgetown used to have different names. They were changed in 1880 to be consistent with the rest of the District’s street grid. In the interests of celebrating Georgetown’s past as an independent city, should we consider changing them back? Changing the names back to the old names would be silly and confusing (and probably expensive). But that doesn’t mean we can’t do something to highlight the 120 years Georgetown spent as an independent municipality. It’s impractical to ask people to install similar signs on their houses here in Georgetown, but could we install alternative street signs below the official names? 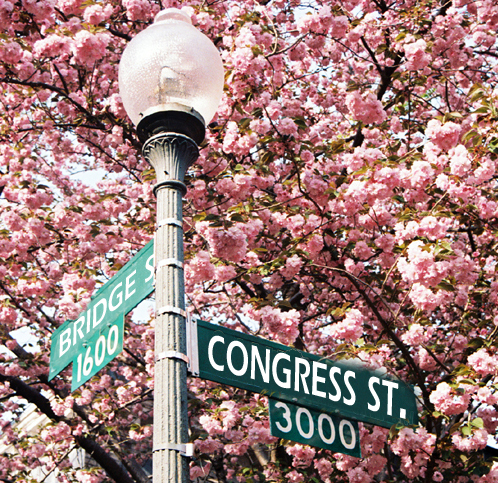 In the Capitol Hill Historic District they have emblem signs on the sign posts; Georgetown really has nothing like that. 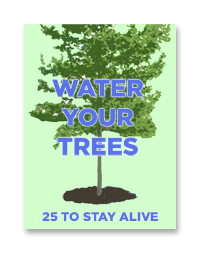 First of all: we ought to do something like that. Moreover, in whatever we do we ought to consider putting in an acknowledgement of what the old street name was since it’s an expression of Georgetown’s independent past. 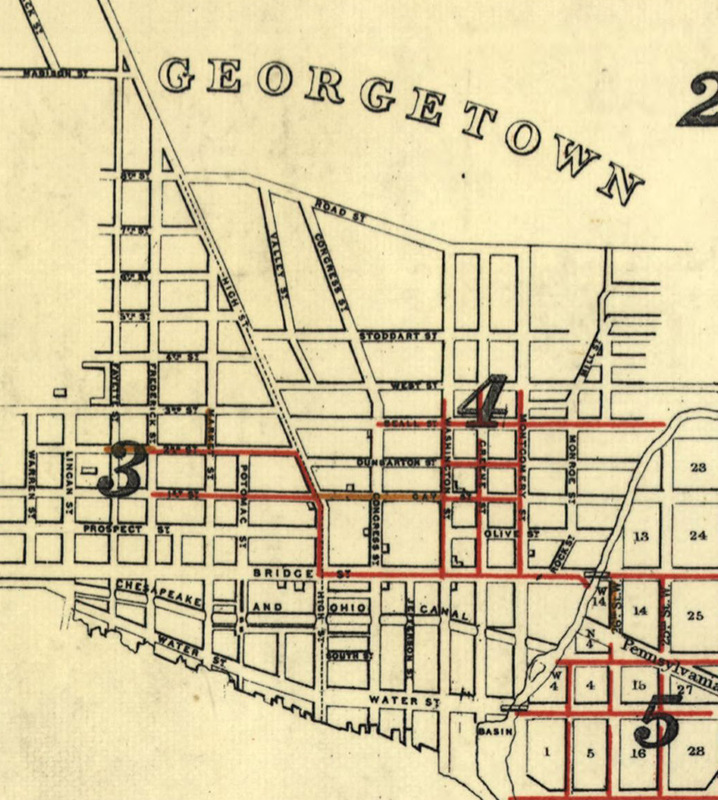 We have an 1855 Colton map of “Georgetown and the City of Washington”, which lists the old-style street names. The streets running north from the Potomac are: Water, Bridge, Olive, Gay, Dunbarton (no street or avenue designation), Beall, West, Stoddard and “Road Street”. That’s all east of High Street. On the other side of High, north of Bridge, it’s Prospect St. and then numbered streets from 1st to 8th. I never really looked that closely at the street names before. Cool! come to ledroit park, and you can see examples of signage noting the old names of streets already installed! 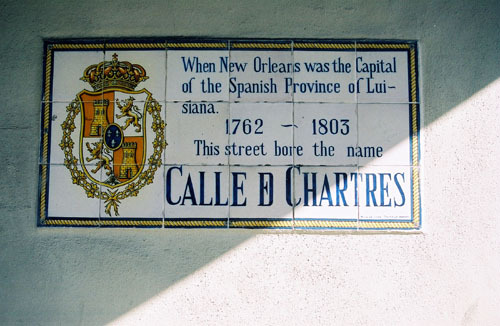 ledroit’s street names were different before being integrated into the city grid as well, and some streets have the old names noted as well. I didn’t know that Ledroit Park did something like that. I’ll have to stay on the G2 sometime and check it out. What do you mean, “with the exception of ‘Road Street'”? That’s without question the best of the bunch! Pure genius. I have to say, I like this idea a lot, and as someone who grew up in DC, I don’t think the impracticality of the change should stand in its way. These historical flourishes are very important in building an area’s historical character, and among the most undervalued aspects in the cultivation of local pride is the sheer nativist cussedness of people who know the local rules lording it over people who don’t. Learning the correct pronunciation of “Houston St.” is an immigrant ritual in New York, as is understanding that Hudson St. is 8th Avenue; there’s no good reason why it is, it just is. DC should have more of this pure local dialect, and putting up some indication of the old local street names in Georgetown is a small shift in the right direction. What do you mean, “with the exception of ‘Road Street’”? That’s without question the best of the bunch! Pure genius.